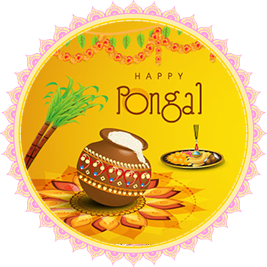 Bhogi is the first day of the three day festival of Pongal which is celebrated in southern India. The three days are known as Bhogi, Pongal and Mattu Pongal. Bhogi falls on the last day of the Tamil month Margazhi (often January 13, but sometimes January 14). Bhogi is also part of observing the astronomical phenomenon called Ayana which involves the course of the Sun. Bhogi occurs on the last day of Dakshinayana, a six month cycle of the Sun’s course moving south. Dakshinayana lasts from the time from Sun is in Cancer in July until the Sun goes into Capricorn in January. Dakshina means compliant and able. Dakshinayana is followed by a six month cycle of the Sun’s course moving north called Uttarayana. Uttarayana lasts from the time the Sun is in Capricorn in January until the Sun is in Cancer in July. Uttara means upper or superior, and Uttarayana is considered an auspicious cycle for publishing, launching new ventures or bringing things out into the world that a person wants to last a long time. How is Bhogi Pongal celebrated? On Bhogi people clean their houses, get rid of unwanted things, apply white wash, draw rangolis or kolam (beautiful geometric or symbolic floor and ground designs often drawn in rice flour or other substance) to enthusiastically welcome a fresh start with the Sun’s upcoming new cycle. In many village areas, this time is associated with the harvest, and Indra is worshipped as an archetype who has the power to bring rains and abundance. There is recognition of the divine forces that govern nature and that are so important for successful crops for the farmers. In some farming areas, special poojas are done, and some of the farming tools are consecrated and anointed with sandalwood paste before the harvesting begins. In some locales, Indra himself is called Bhogi, so this is celebrated as “his” day. People seek his blessings for successful harvest, prosperity and happiness. Why is removing debris associated with Bhogi? In some places the unwanted items that are to be discarded are burned in a fire. For some neighborhoods, the custom is for people to collect all the waste, unwanted, unused and old things and pool them at a place in the street. Then people join together and burn a bonfire. This indicates that people cleared their houses and surroundings and cleaned up their space to welcome a fresh cycle of new auspicious beginnings. Indeed, this festival day does not have material significance alone. Bhogi has a greater spiritual significance, too. It reminds us that we need to give up all our negativity, remove the unwanted thoughts, burn our ego, attachment to the materialistic world and create space for love, compassion, positive attitude and happiness in the name of the divine. It is a day to forgive others and lay down jealousy or grievances and go forward with a clean heart.